The Inn at Wise is home to hallowed halls, amazing history, and a story that is uniquely Southwest Virginia. This hotel is located in downtown Wise at the heart of the Chillin' and Grillin' event. The Inn at Wise is the complete package – with conference center caliber meeting facilities, full-service catering, and three dining options that will satisfy even the hungriest in your crowd. Our fully renovated guestrooms feature the very best of accommodations in a variety of combinations to best suit your travel needs. In-room Keurig coffee helps you greet the morning as you crawl out of your pillow-top king or queen mattress. Entertainment is at your fingertips with your large flat-screen TV, and Oxygen restroom amenities add that extra touch of luxury. The Best Western of Wise has rooms available and is only 3.5 miles from downtown Wise. This Wise hotel offers 60 well-appointed guest rooms and suites, each featuring cable satellite television and high-speed Internet access. Hotel guests will wake up to a delicious complimentary continental breakfast each morning before enjoying the indoor swimming pool and fitness center. The hotel also features limited business services and meeting facilities for corporate travelers. Click on the photograph to be taken to the reservation website. 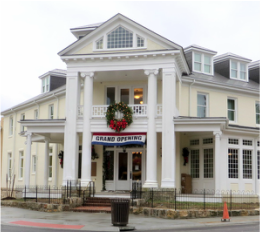 The Holiday Inn of Norton offers travelers a comfortable stay in Norton VA, which is just a ten minute drive to downtown Wise. While lodging at our hotel in Norton, Virginia, enjoy our amenities like the heated indoor pool, 24-hour fitness center and on-site restaurant, where kids under 12 can eat for free. Book your hotel reservation today by clicking on the photograph on the left.